Ramadan Fruit Kebobs – Hello Holy Days! One of Ramadan’s traditions is to break fast with dates; for a fun twist, fashion dates into wonderful fruit kebobs! Along with dates, we’ve paired melon moons, pineapple and mango stars, and purple marshmallows and grapes for a themed Ramadan treat. 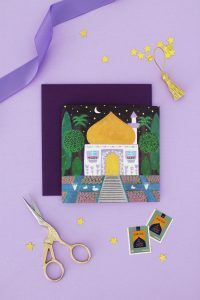 These are especially great to make with kids and a great activity to help them learn how Ramadan’s traditions correlate with the night. You don’t need a specialty cookie cutter either for the crescent moon – you can make do with any round one you have at home. Cut melons into 1/2″ thick slices. Use a round cookie cutter to cut a chunk from the melon. Reposition the cookie cutter on the chunk and cut out a crescent shape. From one slice of melon, expect approximately 2 crescents to result depending on size of slice. Cut pineapple into 1/2″ thick rounds and use a star cookie cutter to make stars. Repeat with mangoes, or cut mangoes into chunks. Assemble the kebobs by inserting fruit and marshmallows along the sticks. If using sliced banana, drizzle banana with lemon juice to reduce browning. Serve within 1-2 hours of assembling.